İkram Korkmazer runs a butcher shop in Turkey. 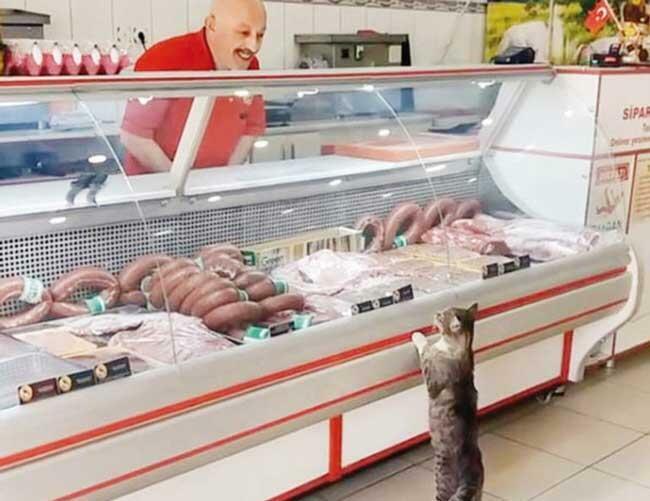 Sometimes there are many customers waiting to buy meat but one of Ikram’s cutest customers is a cat named Yeşim. “I’ve been looking after animals for years. I have been together with Yeşim the cat for four years. She is a wild cat, so she will not jump in your lap. But she will not leave the shop until she gets what she wants. She is very clever. She waits in line even when the shop is crowded with customers,” İkram said. Videos of Ikram feeding Yeşim have gone viral. Although Ikram doesn’t mind the cost of feeding Yeşim, he does appreciate the money earned by videos of him feeding the cat. Now Yeşim gets fed, Ikram gets paid for his videos with the cat, and everybody’s happy (except the poor animal that Yeşim happens to be eating at the time). To read more about the Turkish butcher who feeds a polite cat, click here.